Don’t let an otherwise well planned property removal spiral out of control by handing it over to just any removal company out there. Not all moving companies are created equal, and at Removals South Woodford we believe that we have what it takes to handle your relocation project with professional pace, precision and efficiency, and without the usual hefty price tag so common to other service providers. The company also offers customers access to a well-priced packing service. Good packing of your items means less chance of damage during handling and transportation. Not that we tend to break or lose things, but extra peace of mind is always good for everyone. In case customers wish to self-pack, we will be able to deliver the required packing materials without excess cost. On the same note, we hire only specially trained movers who have the necessary skills and expertise needed to take care of your removal in South Woodford. Working with qualified professionals means less chance of damage, timely completion and no foreseeable setbacks. Since our well organised removal teams will handle everything from start to end, you have hardly anything to worry about and a chance to do some shopping in South Woodford, or grab a cuppa at one of the many cafes situated along George Lane. 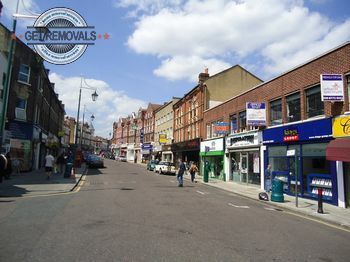 Shops and amenities in the area can also be found on Woodford Green High Rd. If you feel like grabbing a bite, there are a number of good restaurants also on Woodford Green High Rd. South Woodford is serviced by an Odeon cinema, also on High Rd. The area is also home to a drama school, which has its own theatre, staging performances almost every week. The theatre company is called Vital Stages.